This week, John Holl joins the show to talk about his new book, Dishing Up New Jersey: 150 Recipes from the Garden State (with photos by my wife)! We also get into his work as editor of All About Beer, becoming a journalist at 16, traveling to Cuba on a beer run, the weirdest ingredients that craft brewers incorporate, why he thinks NJ is the best dining state in the country, and more! Recorded at Carton Brewing Co. Give it a listen! And buy Dishing Up New Jersey: 150 Recipes from the Garden State ! We also get into how newsrooms and journalism have changed over his 20-year career, how he discovered the craft beer scene while reporting on the road, the farthest he’s traveled on a beer assignment, how the Blizzard of ’96 changed his life, why it can be hard to separate craft and mainstream beers, and where his love of NJ comes from. Go listen! John Holl is a New Jersey native and covered the Garden State for the New York Times and the Newark Star-Ledger. He began his career at New Jersey Network Television and has written for the Wall Street Journal, the Washington Post, Wine Enthusiast, and many other publications. 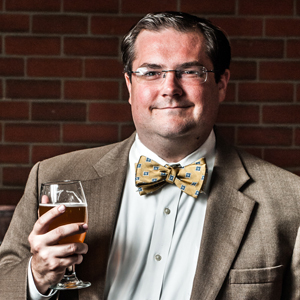 He is the award-winning editor of All About Beer magazine, the author of Dishing Up New Jersey and The American Craft Beer Cookbook , and is a syndicated newspaper columnist. John is an avid home cook and lives in Jersey City, where his exit is 14C. Credits: This episode’s music is Nothing’s Gonna Bring Me Down by David Baerwald, used with permission from the artist. The conversation was recorded at Carton Brewing Co. in Atlantic Highlands, NJ, on a pair of Blue enCORE 200 microphones feeding into a Zoom H5 digital recorder.